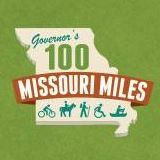 Because this funding is so important, the Missouri Bicycle & Pedestrian Federation Board is joining numerous organizations across the state--from the Missouri State Parks Foundation to the Missouri Rock Island Trail, Inc. to the Missouri Farm Bureau--who support renewal of the tax. Please vote Yes on 1 November 8th, for our Missouri parks, trails, soil, and water. Official ballot language for Amendment 1 & full text of the amendment - Note that the full text appears long and complex--but in reality the long and complex text has been in place for over 30 years and all we are doing this year is extending the existing constitutional language for another 10 years, as required in the amendment that was originally approved. Working to create a world-class transportation system in Missouri for people who walk, bicycle, and use trails is one of the four primary goals of our Vision for Bicycling and Walking in Missouri. 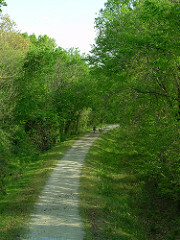 Supporting the Katy Trail, the Rock Island Trail, the over 1000 miles of existing trail in Missouri State Parks, and connections between these state trails and communities all around the state is one of the primary ways we work to support that vision. Have you considered joining our premier Yellow Jersey Club--our highest level of support at $1000 annually? Or becoming a member of our Sustaining Membership Circle--starting at just $5/month?